Ted is the cuddliest cat you could know. He’s my writing buddy, window guardian and a fellow bird watcher. I have two dogs who are both crazy trouble on legs. Ted has more important feline business to get on with. ‘Something new! I must rub my face on it!’ He is king of the house, but we didn’t go out looking for a magnificent cat. He came to us. In 2011, there was a compost heap tucked at the far end of garden, and one day I spotted a black and white cat curled up on top of it. He kept coming back every day throughout autumn, keeping warm on top of the rotting leaves as the nights grew colder. He was a peaceful soul. Birds landed next to his paws and he just let them flutter off. He had to belong to someone, but he was skinny and sad, so we left food out for him at night and let him be. Soon, we realised, the cat wasn’t leaving the garden. He spent days and nights tucked up in a box under the conifer trees. We popped down to feed him and see he was ok until, eventually, he let us get close. His fur was matted, his legs and belly were muddy, his left ear was half-missing and he had a runny nose. No one was looking out for this cat, and he needed some help. We added a blanket and hot water bottle to his den, but then the snow started. The wetness and cold of early winter was proving too much for his health. He looked sickly and rarely moved, so on December 2nd, we managed to tempt him into a dog crate and bring him inside. He ran around that crate in a frenzy for two minutes, wild-eyed and afraid, until he realised that being in the house wasn’t so bad. 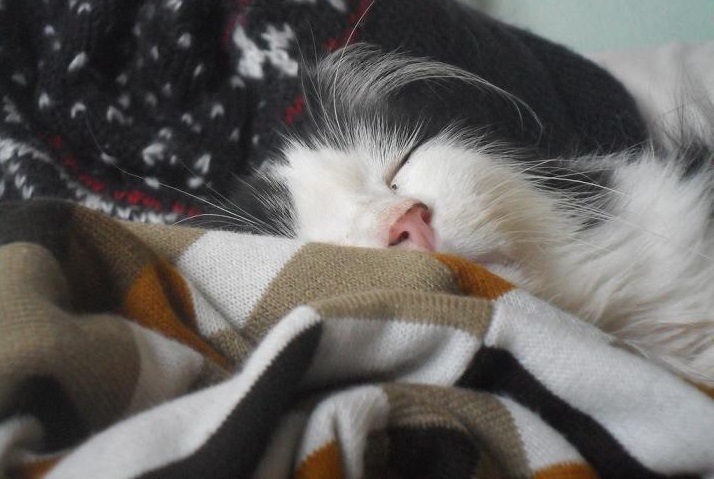 He was warm and safe for the first time in a long while, so he sat down, snuggled in his fleece and slept. Throughout December, that crate became his sanctuary. He slept most of the time, sometimes coming out to stretch his legs, but always returning to his safe place. We managed to bathe and shave him and took him to the vets. He had health problems that would never improve and his cut ear marked him as a feral cat that had been caught and released. “Do you want to hand him over for re-homing?” the vet asked. That day, Ted was microchipped and returned home a full member of the family. Now he sits on my desk when I’m writing, demands tummy and cheek rubs at times that suit his busy snoozing schedule, and has a definite soft spot for my mum. He’s never shown any interest in venturing back out into the world. 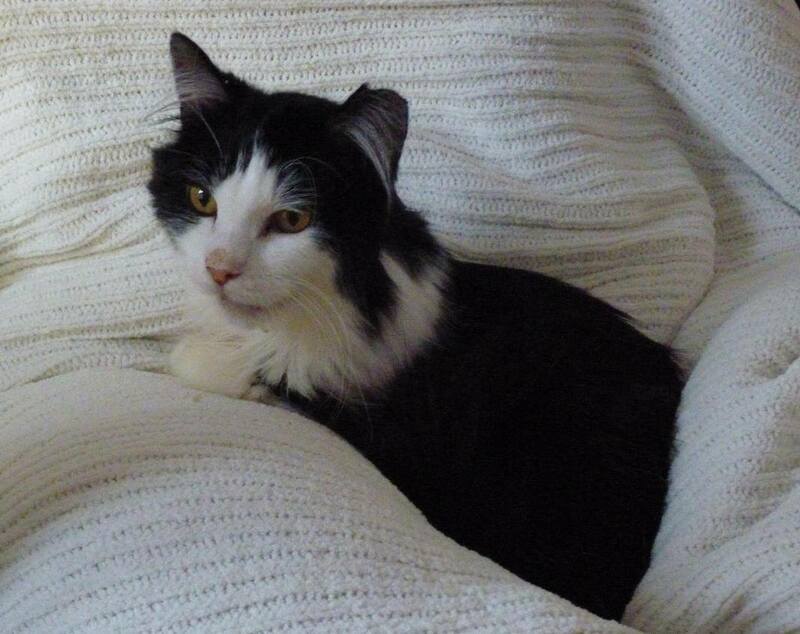 He has cosy dens, warm blankets and plenty of humans to cuddle up with on a night. It took a long time to gain his trust, but he is worth every moment of it. In our house, December 2nd is Ted’s Day, and Christmas will always be the time when he joined us; our little wild man who came in from the cold. Jenna Burtenshaw‘s latest book WINTERCRAFT: LEGACY, the third in her critically acclaimed WINTERCRAFT series, is out now.